DMX Interface is a device that can receive DMX messages and control different type of lights. 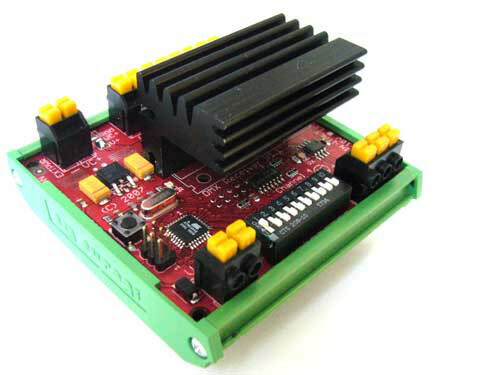 It is designed to be powered at 12v and housed in a standard DIN enclosure. When connected with in a DMX network, it can be used to control a 4 groups of lamps from a central location. It can be used to control Incandescent and LED lights. Up to 128 of these devices can be connected on a single cable to control up to 512 groups of lamps. DMX is the most common light-control protocol, used in theatre, concerts and building. There are a lot of software packages, both free and commercial, that can be used to control lights. The DMX-PWM converter is used for brightness control of 4 low-voltage LED or incandescent lamps via the DMX protocol. PWM is used to control up to 4 groups of LEDs allowing RGBW operation. DMX messages are converted into PWM signals driving 4 power MOSFETs and DMX address is set via the DIP switches. Este producto esta en nuestro catálogo desde martes 21 octubre, 2008. Copyright © 2019 Gtronica - Todos los direchos reservados.